But fine art woodworking is just a part of the artistic world of Thos. Moser. Well underway is the Thos. Moser Winter Art Exhibition. 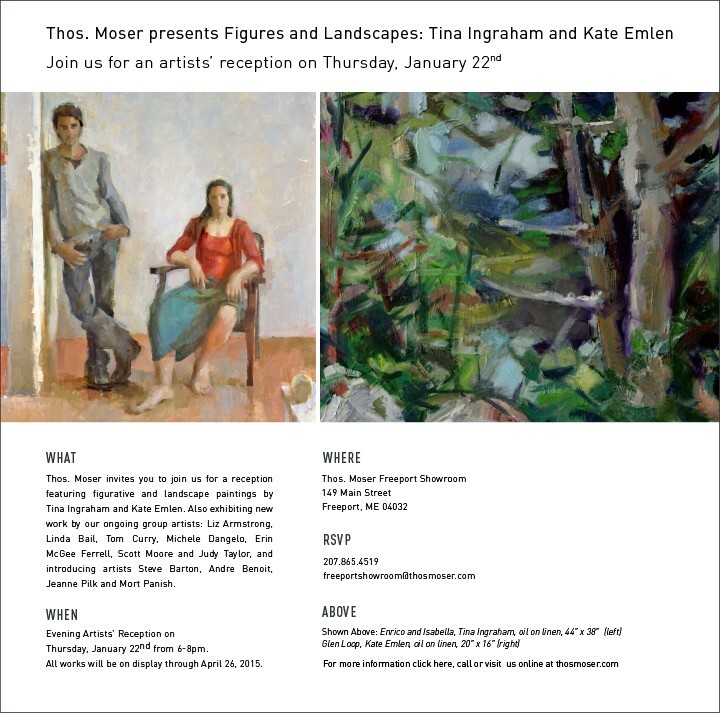 Currently, in the Freeport showroom, the art exhibition Figures & Figurines: Tina Ingraham and Kate Emlen, is ongoing, where art will be on display and purchasable until April 29th, 2015. Eleven other artists also have pieces included in this exhibition. Tina Ingraham, originally from Kenton, Ohio, has called Maine home since 1977. Her pursuit of art began at the University of Cincinnati where she obtained her Bachelor of Science in Design and her MFA in painting from Brooklyn College. She has been a visiting assistant Professor at Bowdoin college, a Guggenheim fellow, and the recipient of the Pollock-Krasner Foundation Grant, which extended her studies in Italy and influenced the development of her technique. Kate Emlen, of Norwich, Vermont, has spent summers in Brooksville, Maine throughout her life. She paints primarily landscapes and still life. Like Tina, Kate’s roots lay in a design background. She graduated from Kirkland College in New York, and went on to earn her MFA in design from Yale. For 20 years, she made her mark in the graphic design world, where her poster designs earned her international renown and acclaim. During the mid-1980’s, she shifted her attentions to painting, and she completed art residencies in the United States, Italy, and France. Thos. Moser doesn’t just exhibit art on occasion. Artists works are featured and sold there on an ongoing basis, and there is no shortage of talent. TJ McDermott, for one, has uniquely crafted wood carvings, with a wide selection of pieces ranging from sign carvings and bird carvings to concrete pieces made from carved wooden moldings. Great care and intricacy is evident in TJ’s work, and is coupled with a depth and texture that only well-executed wood carvings can achieve. 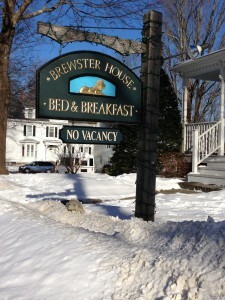 What’s more, TJ carved the sign for Brewster House Bed & Breakfast, demonstrating just one dimension of his artistic capability and eye for detail. Since you’ll be visiting Thos. Moser’s Exhibition, book a room with Brewster House Bed & Breakfast. We’re nearby in Freeport, and we have impeccable accommodations that can offer you a night’s rest after perusing the art and enjoying some fine local dining.